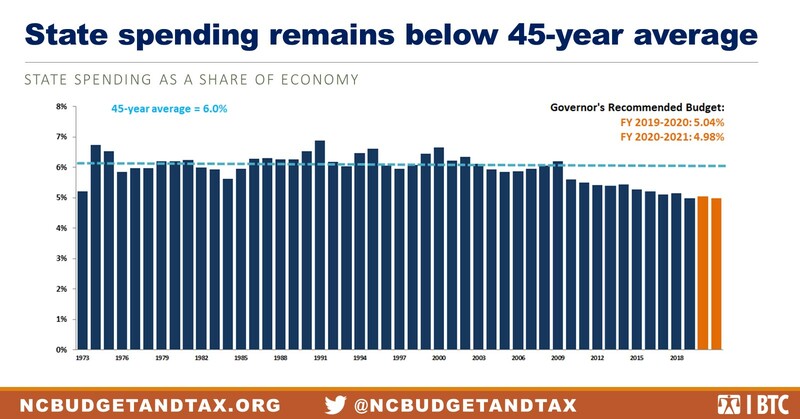 Governor Cooper released a proposed budget for the next two years, but long-term structural challenges in funding services and programs will continue to plague North Carolina due to tax cuts that have primarily benefited the wealthy and big corporations. Indeed, Governor Cooper’s boldest investments in education and health are made possible through bond financing, tapping heretofore untapped federal funding streams and enacting provider assessments to meet the state match for Medicaid expansion. Given the political realities that remain on Jones Street, the Governor’s budget makes no changes to the state tax code, which is upside-down and inadequate to meet the needs of a growing state. In many areas, priorities identified in communities and by North Carolinians will continue to go unmet. This budget proposal makes clear the damage of cutting taxes for the wealthy and profitable corporations to our communities. Let’s hope members of the General Assembly embrace the fiscally responsible approach to our state’s health care crisis and recognize that a similarly sustainable and fiscally responsible approach to supporting all aspects of the lives of North Carolinians is needed and must include raising revenue. Here are four points that provide a review of the Governor’s budget proposal. State spending as a share of the economy will continue below the 45-year average. The proposed budget for the next two years holds spending at historically and arbitrarily low levels as a share of the economy. The first fiscal year of the two-year budget would invest at 5.04 percent of state personal income, while the second fiscal year appropriates state dollars at 4.98 percent of state personal income. A base level of public programs and services can support the growth and health of an economy, support family and community well-being, and ensure children have a path to greater opportunity. Arbitrarily low levels of spending as a share of the economy that don’t reflect community needs undermine that role for public investments. 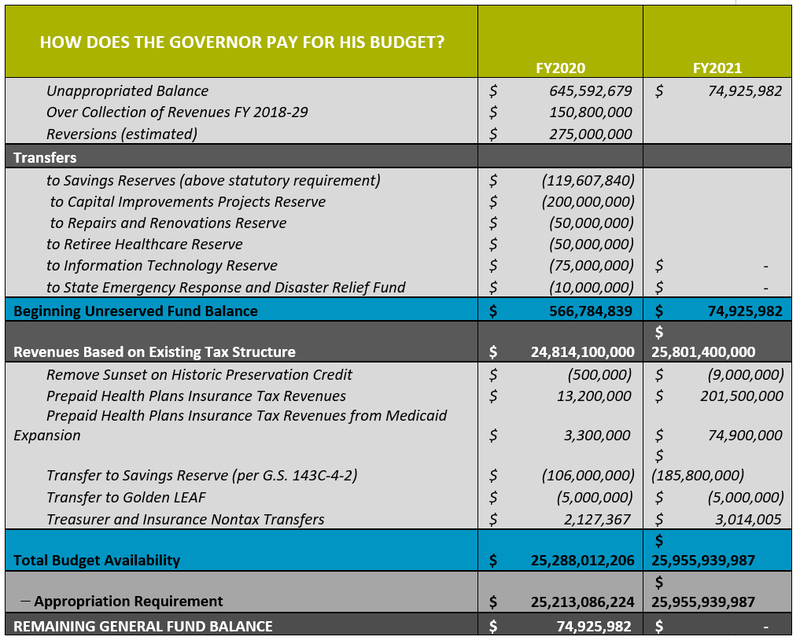 The Governor uses the existing base-line revenues with the slight over-collections projected, along with one-time money, to pay for his budget. As opposed to the approach the Governor embraced last year with a proposal to stop scheduled income tax rate reductions, Governor Cooper’s budget relies this time on unappropriated balances, reversions, and modest revenue collections above projections to fund current service levels and expand services in a narrow set of areas. The Governor doesn’t address the upside-down nature of the state tax code, but he does pursue other financing tools to advance priorities in education and health care. Source: Special Data Request to the Institute on Taxation and Economic Policy, January 2019. 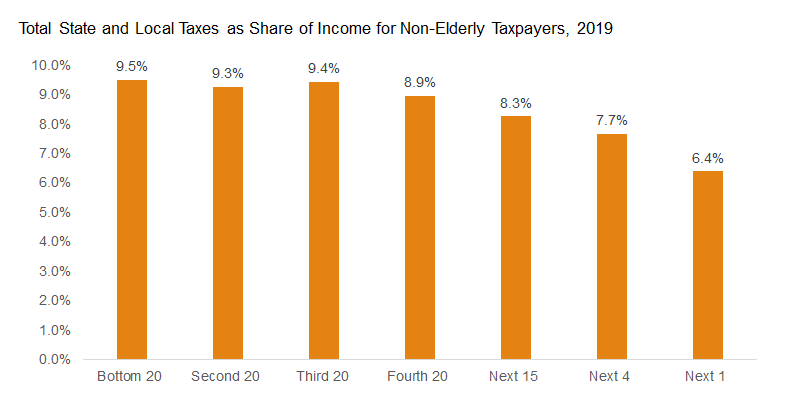 The state’s current tax code is upside-down, asking more from middle- and low-income taxpayers as a share of their income than from the wealthiest. The Governor’s proposal provides no solution to this issue with our tax code. It does, however, pursue bond financing that will be paid for, ultimately, by taxpayers and assessments on health-care providers to meet much-needed investments in upgrading school buildings and supporting the health care of hundreds of thousands of North Carolinians. The state’s structural challenge of meeting community needs with an inadequate tax code remains with this proposal. The Governor’s proposal for Fiscal Year 2019-20 meets current service levels. In the second-year of the two-year budget, so-named “must-dos” in the Governor’s budget that reflect what is minimally required to continue to deliver current services to the state’s growing number of students and people total $838.5 million, but the increase in the budget year-over-year falls short by increasing overall spending by $742.8 million. Because the Governor’s budget doesn’t address the underlying inadequacy of the state tax code, it also does not address future projected structural deficits — the gap between revenue and maintaining the same level of services delivered now over time. The tax code is projected to fall short of needs by more than $1 billion in Fiscal Years 2022 and beyond. Alexandra Sirota is the Director of the Budget & Tax Center, a project of the North Carolina Center. Suzy Khachaturyan, a Policy Analyst with the Budget & Tax Center, contributed to this post.